As a resident of Clinton Hill, Brooklyn, and a car owner, I’ve already welcomed Citi Bike into my life. Each morning, after taking my kids to school nearby, I use Citi Bike to get to a different subway stop in Brooklyn and head to my office in Williamsburg or in Gramercy. Between MNS Gramercy and MNS Chelsea, in the past had required an M23 bus and a walk. No more. A one-way Citi Bike journey has been a great benefit—forget about waiting for a $15 rush hour cab to go 20-30 blocks. See you later, subway transfers. What could be more in keeping with the spirit of New Yorkers than transportation when you want it—in other words, on demand. People will rethink how to get from point A to point B with the bike share program in the mix. How else will it make a difference? A recent study by the National League of Cities found that a bike share program “boosts retail exposure and home values.” In a recent poll conducted by The New York Observer, vendors and shopkeepers reported an uptick in business. I think it will go well beyond that to encourage exploration. In the language of architects and city planners, it transforms the liminal space. Bike share also slows vehicular traffic, not just making it safer, but allowing residents to notice buildings, architecture, new restaurants and new stores. It’s no coincidence that Related Companies recently added bikes as the newest amenity in ten Manhattan rental properties. New York has long been America’s answer to world cities like Paris and London, and now we’re taking the lessons on bicycling and implementing them in an outsized way: Commissioner Janette Sadik-Khan pushed through the creation of 250 miles of bike lanes and protected routes, and statistics have shown that streets with bike lanes are 40% safer. (That’s what happens when vehicular speed decreases by as much as 10%). That’s not to say that accidents don’t occur, but according to an impromptu conversation I had with EMS recently, the large majority of bicycle collisions are minor, and don’t require hospital visits. 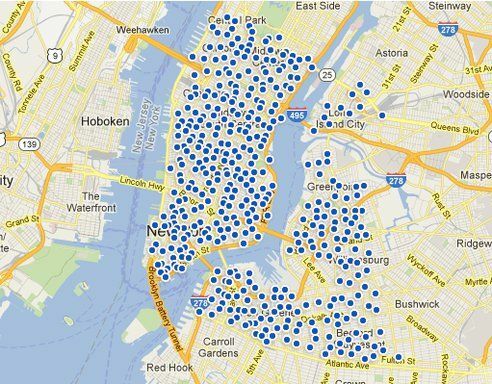 New York City’s bike share program is already having a tremendous impact on the city.